I say “purports” because I’ve not been able to find this particular shot and caption on any official Microsoft sites. I first encountered it in this story about Band from October of last year, and I also found it posted to a Reddit thread around the same time. You can watch the official ad here. 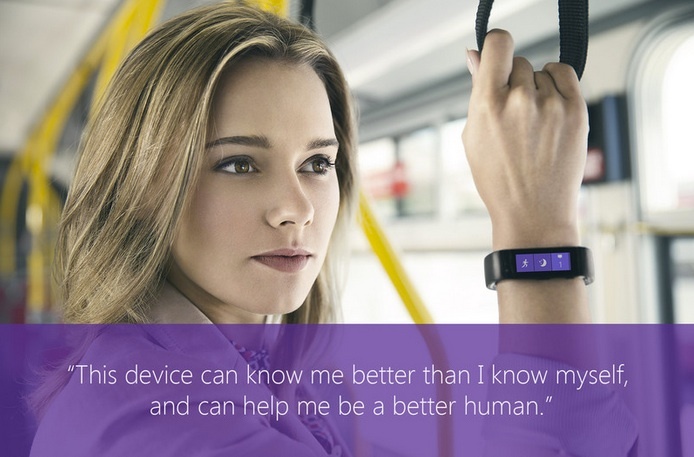 It may be that this image is hoax or that Microsoft decided it was a bit too disconcerting and pulled it. A more persistent sleuth should be able to determine which. Whether authentic or not, however, it is instructive. Again, the “they” in this case appears to be a bit ambiguous. That said, the picture is instructive because it reminds us, as Seaver’s reply suggests, that more than our physical fitness is at stake in the emerging regime of quantification. If I were to expand my list of 41 questions about technology’s ethical dimensions, I would include this one: How will the use of this technology redefine my moral vocabulary? or What about myself will the use of this technology encourage me to value? It is not, of course, that I necessarily think users of Band will be so naive that they will consciously believe there is nothing more to their identity than what Band can measure. Rather, it’s that most of us do have a propensity to pay more attention to what we can measure, particularly when an element of competitiveness is introduced. I’ll go a step further. Not only do we tend to pay more attention to what we can measure, we begin to care more about what can measure. Perhaps that is because measurement affords us a degree of ostensible control over whatever it is that we are able to measure. It makes self-improvement tangible and manageable, but it does so, in part, by a reduction of the self to those dimensions that register on whatever tool or device we happen to be using to take our measure. A certain vigilance is required to remember that our often marvelous tools of measurement always achieve their precision by narrowing, sometimes radically, what they take into consideration. To reveal one dimension of the whole, they must obscure the others. The danger lies in confusing the partial representation for the whole. < Previous What Do We Want, Really? Yes, the time is fast approaching. Microsoft, et al., don’t really want us to find out about ourselves, or anyone else; they want to find out about us! Bottom line, I don’t want any device making decisions on my behalf (or “knowing me better than myself”). If that makes me human until I die, so be it. Human 100% until the end. Another great post. I’d agree that the band alone doesn’t redefine (or just define) the self, but I’m worried that it’s part of an overall environment that does. What this sort of thing pushes us toward, whether out of cynicism or just as a byproduct of finding more things to sell, is a day when we will feel uneasy or superstitious answering any question about ourselves without checking our devices to make sure we’re not wrong. What would we consult in ourselves that they won’t purport to mirror or monitor, along with all of their privileged information? There are qualities of life I’d like to list, but the problem is that these ads are the rebounds of exactly those questions. Technology alters the territory beneath the same words we use to indicate the alteration. It’s as White says in McCarthy’s The Sunset Limited, “You give up the world line by line”. Well put. Thanks for that last line from McCarthy, excellent. You are a seriously deep thinker by any measure! It’s a thoughtful post and one worth reading. Thanks for sharing. Our essence, ever allusive (and I’d argue, at the very best, unknowable, and more likely, not a real thing––my humble opinion), becomes a fantastic space to develop. In short, you may or may not have an essence, a self, a being, but hell, that doesn’t matter, because we’ll sell the idea to you any way––or, said another way, your being can be sold back to you as measured, quantifiable, and ultimately knowable––the modern self, on your wrist nonetheless! I do think it will be helpful to keep one more aware of himself/herself and to further contribute his/her health. But as for me, I think quantifying my life is a little bothering since I‘ll take it as a task or work. And it make my life more complicated. That gut wrenching feeling I had while watching “blade runner” many years ago could be coming true!